As I stated earlier in this tome, all of the Toon Town attractions have been intimidating to recreate in foamboard. They are curvy, not well-known rides which will be difficult to render and have a low impact on the overall look of the costume. 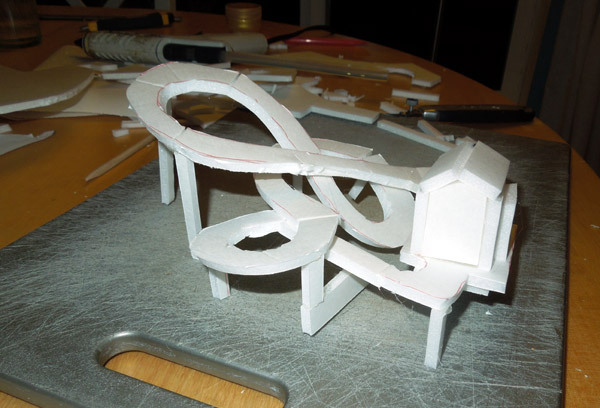 One of the final constructions was Gadget's Go Coaster, a kid-size roller coaster with a chipmunk inventor theme. I started with the pathway of the coaster tracks, grafting several pieces of foam roadway together to form the complete course. To get all the parts of the roadway together, I cut relief cuts in the path so that it could be bent into small ramps and loops. 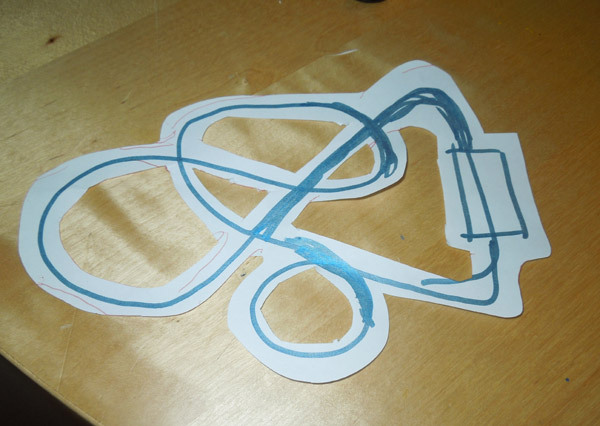 The result was a complicated tangle. It looked great! I added a bunch of thin stilt legs and a small building for the loading/unloading hut. 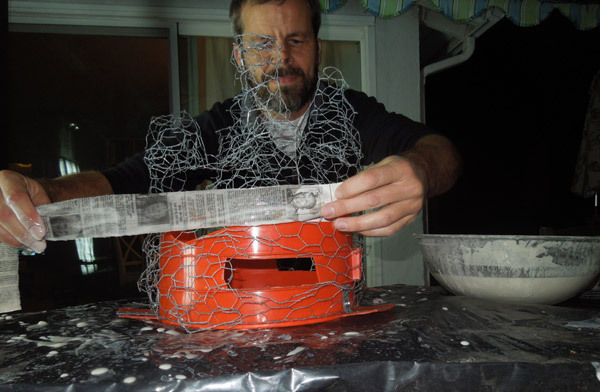 I was determined to get the mechanisms for the roller coasters working well before I forged ahead with the paper mache skin. I probably spent the most time with the Splash Mountain belt-drive, but the turntable mechanisms were a bit less reliable, so they held the threat of having to be repaired from below. 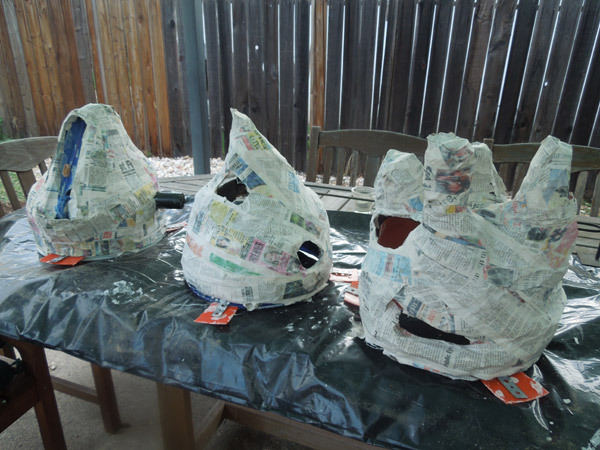 For paper mache I bought a Sunday newspaper. The news used to come on these. Eight and five years old, I don't think my kids have ever read the Sunday comics in the newspaper. I tore it into long strips, about an inch and a half (5cm) wide. The glue is water and flour. I use my hand to break apart the clumps and get a smooth paste, about the consistency of gravy. Then I drag the strips through the paste and squeegee most of it off between two fingers. 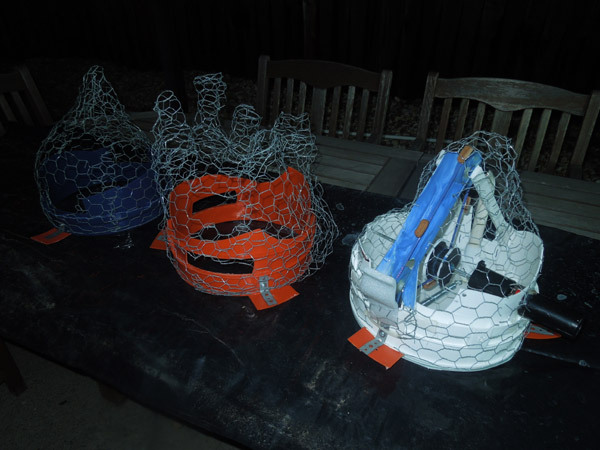 The first strips are difficult to lay down, as the wet paper doesn't stick well to the chicken wire mesh. The strips do stick well to themselves, so after a few strips are stuck, the rest are easy to lay down. As I alluded to above, I had been anticipating this step for months, and once I was ready, I ran with it. It was midnight when I started, 2 am when I finished with the cleanup. The next morning, my mountains were starting to dry. That's Splash mountain on the left, the Matterhorn in the middle and Thunder Mountain Railroad on the right. I should have been exhausted, but I was exhilarated. This was a big step towards Disneyland coming together! 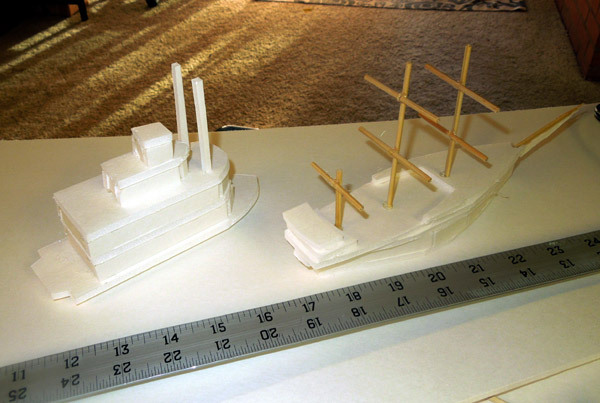 Almost done with miniature construction, I had saved the two river boats for the end. These were going to be fun! I studied the basic shapes and made some sketches. Next I started cutting pieces out of foam board. 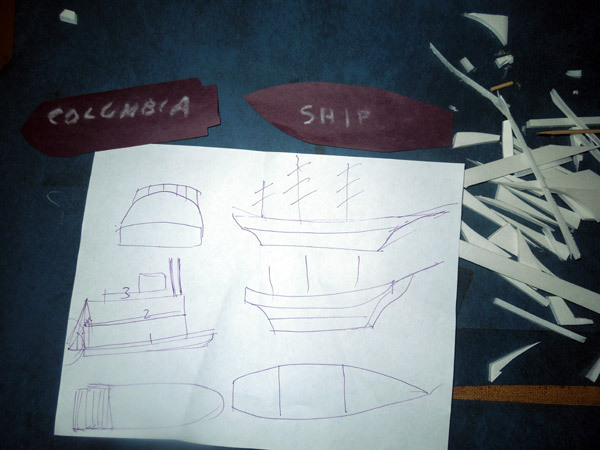 The Colombia is the boat which looks like a pirate ship, pointed at both ends with three masts and sails. 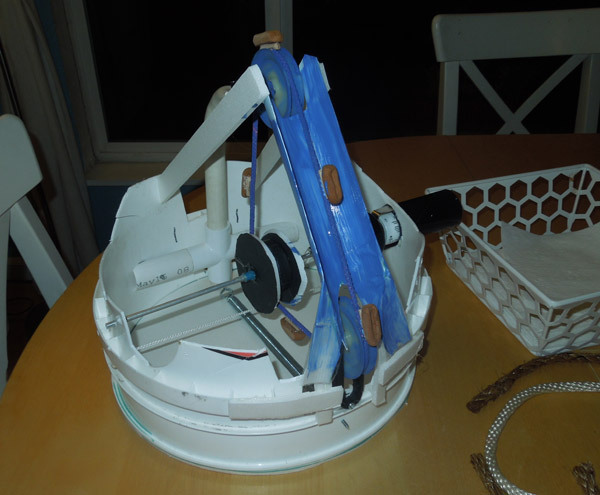 I built up several layers of ship-shape foam and glued them together, adding a rear and fore deck at the top. I used some wooden skewers for the masts. The Mark Twain is a paddlewheel steamboat. It is more of a blunted rectangle, with four distinct layers set on top of one another. Twin smokestacks decorate the front. These boats looked great in white. I hoped that these two boats on the distinctively shaped Disneyland river would be another crowd pleaser. I certainly loved them!